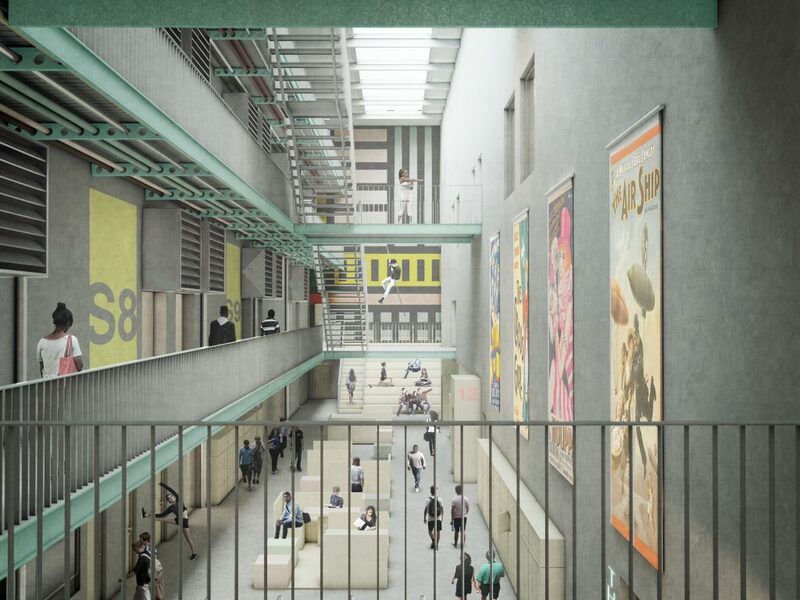 Carl Turner Architects has received planning permission for a new 10,180m² campus for Mountview Academy of Theatre Arts in Peckham – the practice’s first cultural project. Mountview Academy will be built on a brownfield town centre site, owned by Southwark Council and adjacent to the Stirling Prize winning Peckham Library. It faces a proposed redeveloped Peckham Square – also by Carl Turner Architects – enlivening the space and engaging it with the surrounding community. The scheme has been designed with a café and commercial space on the ground floor, ensuring the school has a positive public presence. An events platform for formal and ad-hoc performances at the entrance will further increase the building’s interaction with the public realm, while the square offers usable outdoor space for students throughout the day. The proposed building is conceived of two distinct volumes – a saw-tooth teaching block and a theatre block – visually separated based on their internal functions. A brick-clad teaching block offers silhouetted glimpses of the activities inside, while a Corten-clad theatre block will be brightly illuminated, acting as a beacon of activity amidst the surrounding area. Internally, a central atrium runs from the entrance within the teaching block and rises to 4 storeys, bringing natural daylight deep into the plan. The main 200-seat auditorium will be used primarily as a teaching theatre, while also providing lettable space to raise revenue. A number of the studio spaces have also been designed with the possibility of being rented out for commercial income. A public rooftop bar/restaurant offering panoramic views of the city will be accessible to the public via an independent staircase, enabling the space to function outside Mountview Academy’s operating hours. Mountview Academy is set to be the latest in a series of community regenerative projects in south London by Carl Turner Architects, following the design of Peckham Levels which will provide close to 4000 m² of artist space in an underused car park; Peckham Square, a rejuvenated public landscape in a critical town centre location; and Pop Brixton, a hugely popular ‘mini city’ made up of shipping containers and recycled materials that has provided much needed affordable work and leisure space to the area on a derelict site. “It’s a delight to be working on our first cultural project, having diversified over the past few years as a practice to now be able to deliver substantial regenerative architecture. “Mountview Academy is expected to be complete in September 2018.